Although the paper reports his death and says he was serving with the Royal Wiltshire Yeomanry, CWGC lists his as serving with 2nd Dragoons (Royal Scots Greys).. Soldiers Died does not list him at all. 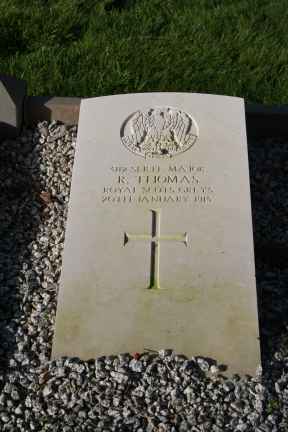 The funeral of Sgt Maj Thomas, Royal Wiltshire Yeomanry, took place on Saturday 23rd January 1915. He had died at Cheltenham the week before (apparently reported in Wilts Times 23 January). After his body had been brought from Cheltenham, it was placed in the Royal Wiltshire Yeomanry HQ in London Road before being taken to the cemetery in a glass sided hearse. The coffin was of polished elm.